Well, another three years has passed and with it another revision cycle of theNEChas been completed. As so often happens during code cycles, several significant changes occurred during the 2005NECcode cycle. One of the more significant changes is the new requirement for industrial machinery electrical panels, industrial control panels, certain HVAC equipment, meter disconnects, and certain motor controllers to be marked with a short-circuit current rating. This article will discuss these new marking requirements and equipment affected, provide background information on the need for these changes, and discuss the role that the inspector plays in enforcement of these new requirements. Varying, but similar, reasons were provided for these changes; however, they all had one goal, to ensure a safe installation through compliance with 110.10 while simplifying the inspection and approval process. Figure 1. With the new equipment marking requirements, compliance with 110.10 is simplified. The new 2005 NEC short-circuit current rating marking requirements facilitate the inspection and approval process. The marking of short-circuit current rating ensures a key piece of information needed for a safe installation is required to be provided (see figure 1). The change from marking the interrupting rating of the main overcurrent protective device or no marking at all, to a marking for the component or assembly short-circuit current rating is a much needed revision. This change clarifies the uncertainty associated with past short-circuit markings that users incorrectly assumed were representative of the entire assembly when, in fact, they were only an interrupting rating of the main overcurrent protective device. By providing a short-circuit current rating representative of the assembly, the procedure for ensuring compliance with section 110.10 is simplified. Short-circuit current ratings marked on components and equipment make it easier to verify proper overcurrent protection for components and equipment for specific applications, whether it be the initial installation or relocation of equipment. For proper protection and compliance with NEC 110.10, the short-circuit current rating for a component or equipment shall be equal to or greater than the available short-circuit current where the equipment is being installed in the system. 2. Upon site inspection, compare the actual equipment marked short-circuit current rating to the submitted data to ensure the rating is indeed as specified and sufficient for the available short-circuit current available at the point of installation. Article 409 Industrial Control Panels is a new article in the 2005 NEC. 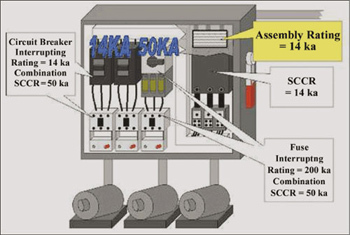 This new article provides minimum requirements to facilitate the safe construction, installation, and inspection of industrial control panels. A definition for industrial control panels is provided in 409.2 to aid in determining the types of equipment to which these requirements apply. A major part of the substantiation for this new requirement is that control panels are being misapplied in a large number of applications because they have an inadequate short-circuit current rating. 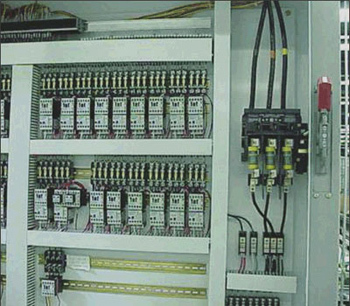 These misapplications often result because industrial control panels have unique conditions surrounding them. Section 440.4(B) was revised to require the nameplate of this equipment to be marked with its short-circuit current rating. This new marking requirement includes the following exceptions: one- and two-family dwellings, cord-and-attachment-plug-connected equipment, or equipment on a 60A or less branch circuit. So for most commercial and industrial applications, air conditioning and refrigeration equipment with multimotor and combination loads must have the short-circuit current rating marked on the nameplate. Figure 4. The characteristics of the overcurrent protective device are used along with the component’s short-circuit ratings for 110.10 compliance. A major part of the substantiation for this change was that there is an increasing number of installations where HVAC equipment installed in commercial, industrial, and multifamily dwellings is subject to high levels of short-circuit current. The majority of HVAC equipment used in these installations was not marked with short-circuit current rating. Without this marking, the installer and AHJ have limited ability to determine if the equipment being supplied is suitable for the application. These new requirements ensure that the equipment is marked with the amount of short-circuit current the assembly can withstand. This information can be used by the installer and AHJ by verifying that the marked short-circuit current rating is less than the available short-circuit current and facilitating a safe installation. Figure 5. Interrupting ratings pertain only to the overcurrent protective device. 2. Machine control enclosures that are not listed are required to provide a short-circuit current rating established using an approved method. A fine print note was added to provide users an example of a method, UL 508A Supplement SB, that could be used to determine the short-circuit current rating. Exempt certain controllers for small motors as allowed in Part VII, such as clock motors, attachment plugs and receptacles, and snap switches. Permit controller short-circuit current ratings to be marked elsewhere on the assembly. Exempt certain controllers used in assemblies which have a short-circuit current rating, as a short-circuit current rating on an assembly covers all of the internal components. The list of equipment allowed ahead of the service disconnecting means in 230.82(3) permits a meter disconnect switch, provided the equipment into which it is installed is grounded. This was revised to include a requirement that the meter disconnect switch has a short-circuit current rating adequate for the available short-circuit current. What Is a Short-Circuit Current Rating? Short-circuit current ratings on components and equipment represent the maximum level of short-circuit current that the component or equipment can withstand and are used for determining compliance with 110.10. This rating can be marked on individual components or assemblies. The new short-circuit current ratings required by 409.110, 440.4(B), and 670.3(A)(4) represent the maximum amount of fault current that the assembly can withstand under fault conditions. Assembly ratings take into account all components contained within the equipment rather than just the main overcurrent protective device. 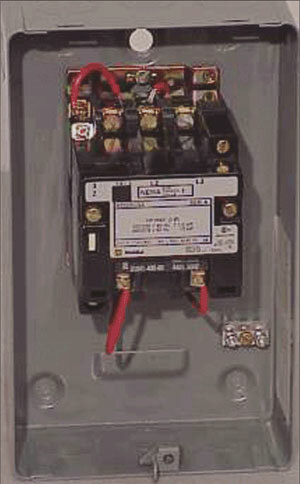 CAUTION: Short-circuit current ratings are different from interrupting ratings marked on overcurrent protective devices. A common mistake is to assume that the interrupting rating of the overcurrent protective device protecting the circuit represents the short-circuit rating for the entire circuit (see figure 5). Interrupting ratings, used for compliance with 110.9, apply solely to the overcurrent device. The characteristics of the overcurrent device (e.g., opening time, let-through energy, etc.) need to be used in determining compliance with 110.10, not the interrupting rating (see figure 4). Why is the short-circuit current rating marking needed? Inspectors and installers need this information in order to ensure compliance with Section 110.10. Equipment installed where fault current levels exceed their short-circuit current limit can be hazardous to persons and property. Short-circuit current ratings marked on components and equipment make it easier to verify proper protection for components and equipment for specific applications, whether it be the initial installation or relocation of equipment. For meter disconnect switches and motor controllers, this withstand level or short-circuit current rating is often determined by product testing. For assemblies, the marking can be determined through product listing or by an approved method. 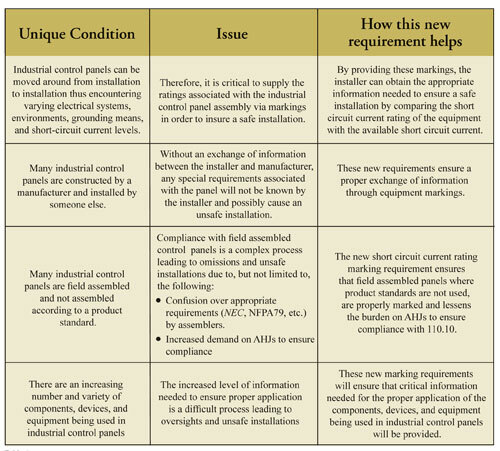 With the release of the Industrial Control Panel Standard (UL 508A), an industry method is now available. Any method used, whether UL 508A or another approved method, should be based on the “”weakest link”” approach. 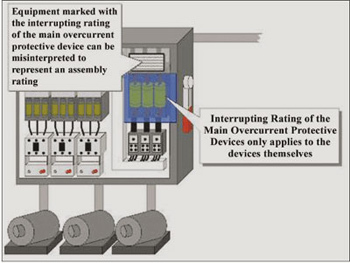 In other words, the assembly should be limited to installation where fault levels do not exceed the withstand rating of devices with the lowest short-circuit current rating (see figure 6). The marking determined should represent the limits of the assembly for a safe installation. Current-limiting overcurrent protective devices can be used in the feeder or branch circuits to increase the assembly short-circuit current rating where lower rated components are used. When current-limiting devices that limit fault-current levels to within the lower rated components rating are used, they provide protection for the assembly provided the current-limiting OCPD is used within its ratings. 1. 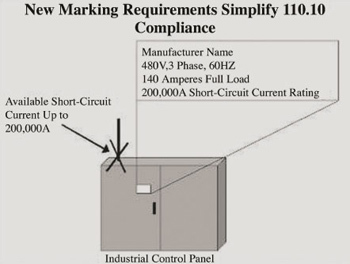 A simpler approach to compliance with 110.10.
a. Verify the maximum, worst case short-circuit current available at the terminals of the supply transformer. b. If all the equipment in the system has short-circuit current ratings greater than this maximum, worst case available short-circuit current, then the detailed short-circuit current study is not necessary. Require a field evaluation of the equipment by a certified testing laboratory. 1. Require a bill of material (BOM) with component short-circuit current ratings in the detail and a schematic of the internal circuitry of the equipment. This documentation can be used for pre-authorization similar to plan review. 2. Require documentation from a professional engineer engaged primarily in the design or maintenance of the equipment and licensed or certified in the jurisdiction or state. The method shall be documented and stamped by the professional engineer. This documentation shall be available to those authorized to design, install, inspect, maintain, and operate the system. 4. If the short-circuit current rating marked on the equipment matches the interrupting rating of the overcurrent protective device in the supply disconnect, verify that a proper method was used to determine an assembly rating. Make sure that the marked short-circuit current rating is not just based upon the interrupting rating of the main overcurrent protective device. This is particularly common on industrial machinery covered by Article 670, as 670.3 in the previous edition of the Code required this misleading method of marking. 5. If there is a high short-circuit current rating marked on the equipment, check to see if there are current-limiting overcurrent protective devices in the feeders and or branch circuits. 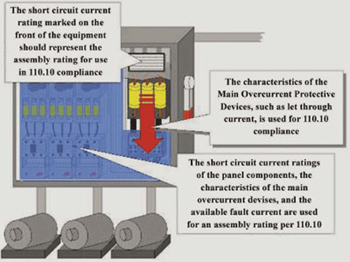 High short-circuit current ratings for assemblies can only be achieved by either (1) the use of components and overcurrent protective devices with high short-circuit current and interrupting ratings, or (2) by the use of current-limiting overcurrent protective devices (see figure 7). While components with high short-circuit current ratings exist, it is often very difficult or costly to find or use them. Therefore, it is common to have a device with a high interrupting rating in the supply circuit or main for the panel and components with low short-circuit current ratings downstream. The marking could inappropriately be based on the interrupting rating of the main overcurrent protective device and not represent what the entire assembly can withstand. Current-limiting devices are the only way to increase an assembly short-circuit current rating where devices with low short-circuit current ratings are used. Ensure that the equipment is marked with a short-circuit current rating according to one of the methods listed above. Ensure that the available short-circuit current at the point of installation does not exceed the assembly short-circuit current rating for compliance with 110.10. The new short-circuit current rating marking requirements are just one of several significant changes that occurred during the 2005 NEC code cycle. As with any requirement in the NEC, a rule is only a rule if it is used and enforced. Hopefully, we as an electrical industry, from designer to enforcer, can work together to make sure that these changes do what they are intended to do.